Aesop gave a bad name to the cicadas. In one of his well-known fables, he talks about a cicada who is lazy all summer, doing nothing but singing under the trees. The cicada urges an ant, who is busy working to store food for the winter, to stop for a while and enjoy the summer. The ant refuses to do so. When the cold season finally arrives, the cicada realizes he has nothing to eat and begs the ant for food. However, the ant castigates him for being a sloth and tells him to dance in the winter to the tune that he had sung in the summer! Unfortunately, as it turns out, Aesop got everything wrong! The cicada is neither lazy, nor sits all summer doing nothing but singing, nor does it starve in the winter, nor is it unattuned to the seasons’ rhythms. Unlike his contemporary equivalent Hans Christian Andersen, who actually studied animals in depth and often had them behave as they do in real life, Aesop never ventured beyond the most basic of observations of nature and he got most of his facts wrong. In writing the “Ugly Duckling,” Andersen incorporated his observation that swanlets are not as beautiful as ducklings, yet they grow into magnificent birds. And in his story “The Storks,” he mentions that the storks migrate from the north to Egypt every summer. However, Aesop attributed qualities to many animals that they did not actually have, simply because he wanted to relate them to humans. Let us begin with their amazing lifecycle that is a hymn to hard work – especially in the winter, when they are supposedly begging for breadcrumbs from the ants! When the cicadas’ eggs hatch in the summer, the newborn nymphs drop to the ground and burrow. They live as nymphs in the depths of the earth – usually about three meters from the surface – for most of their lives. Shockingly, they remain underground anywhere from between one to seventeen years! (According to entomologists, the cicadas’ long lifecycles may have developed as a response to predators: specialist predators with shorter lifecycles cannot reliably prey upon the cicadas.) The nymphs have strong front legs and excavate chambers next to trees’ roots in order to feed on the sap. Some species are also busy constructing mud towers aboveground in order to air their burrows. When, after many years of working underground to sustain themselves, the time arrives for them to ascend to the surface, they construct an exit tunnel and emerge in the stage biologists call “instar,” and start searching for a suitable branch to molt on. After shedding their skins (exoskeletons), they emerge in their full glory as mature adults. Leaving behind their old life in the dark, they now have wings and are ready to fly, sing, and mate – usually on the trunk of a tree (here in Greece, an olive tree). The July song is none other than the male cicadas’ call to the females – yes, as always, it is up to men to do…all the calling and hard work! That’s when we all meet the cicadas: for the brief period of a single month in their multiyear cycle during which they sing and mate. After mating, the female cicadas cut slits into the bark of a trunk or a twig, where they deposit their eggs – for a new cycle to begin. The new nymph emerges from its exoskeleton. The second lesson has to do with the nature of the work itself. Just as Aesop did not consider singing to be proper work, many people are still obsessed with the visible aspects of productivity. Yet a writer meditating on an idea all week, a poet trying to mentally place the right word at the right place, or a composer apparently daydreaming the hours away may all be truly working hard to connect with the creative elements of the cosmos, which may in fact not even reside within them. It is time that we all disengage the “ideal of hard work” with images such as tilling the soil under the blazing sun, or having a busy day at the office. Not all jobs fluff up their feathers! Furthermore, even if we were to consider that the cicadas’ song and subsequent mating activity is to be classified under “leisure,” again, what’s wrong with the poor cicadas enjoying the sunlight for a single month in their long lives? 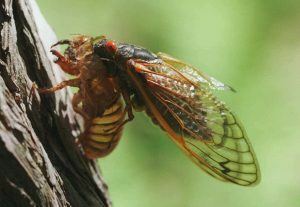 The cicadas are actually the perfect embodiment of what Brother David Steindl-Rast defines as the ideal of leisurely work: “Leisure…is not the privilege of those who can afford to take time; it is the virtue of those who give to everything they do the time it deserves to take.” Seventeen years, that is, under the earth, in order to survive and have a mere month of joyous singing. Such leisurely and rare singing should be celebrated as much as the heroic works of Beethoven! And do not be insulted by the analogy, because, amazingly, the male cicadas that do the singing are deaf – like Beethoven was for most of his life – because they disable their own tympana (ears) in order to prevent damage to their hearing (some cicadas produce sounds that are among the loudest of the insect kingdom). But singing is not the cicadas’ only work. They do something else that is not so well known: While they leisurely sing, they simultaneously take in a lot of sap from the trees they rest on, and then spurt it out in the form of rain! Although many mistake it for pee, it is just tree sap, which is basically water with plant nutrients. So during my midday walk, whenever I pass by a tree full of cicadas and I unintentionally scare them, they fly around me releasing artificial rain, not unlike the water sprays to be found in many outdoor cafes in the south of Europe – put there to ease the summer heat for their customers. The cicada rain is one of those rare miracles that one may easily pass without noticing. Yet, even though it is a small gift of nature, or rather because it is such a small and rare occurrence, the fact that it simply exists should be especially treasured. This brings us to the cicadas’ third lesson: The cicadas withhold nothing; they offer nature their songs as well as the largest part of the water they collect. When they finally die, after their month of crazy activity, they even offer their corpses as food to the many other insects (including the ants!). They come into this world just to give: sing, spray water in the dry landscape and on other animals (like me) who desperately need it in the sweltering heat, and finally offer themselves as food. But the cicadas’ song and rain, apart from the joy they bring me, often make me think: What is my song today? What am I composing, singing, sharing? But also, what is my grander song – the song of my whole life? And what smaller gifts, like the cicadas’ rain, will I give to the world today? The cicadas’ actions enclose these hidden questions for me. Meditating on them is the cicadas’ fourth lesson. Let us now return to those strange deserted exoskeletons that hang like mysterious phantoms from the many branches in my garden. From each emerges a new cicada with wings, which is something that impressed the ancients as much as the butterfly cycle. I was actually very surprised to discover that this usually gray, dull-colored, monotonous singing insect is, for this very reason, a symbol of transformation in many cultures (untouched by Aesop!). In Ancient China, the cicada was considered a symbol of rebirth, fertility, abundance, spiritual realization, and immortality. 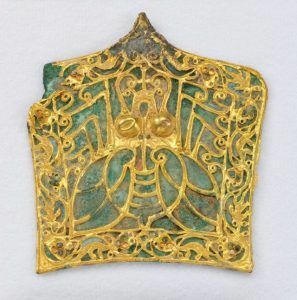 Small cicadas were carved out of jade and placed in the mouths of the recently deceased to aid them in their rebirth. They were also a symbol of resurrection for the Hopi Indians on the other side of the world, who placed carved cicadas alongside the dead for burial. The cicada is actually a better symbol for transformation than the butterfly. Unlike the butterflies and other insects that undergo complete metamorphosis, cicadas have no pupal state. They transform from one fully functioning state to another and therefore their transformation is closer to that of human beings. People do not spin cocoons around themselves and start, like the caterpillar, to create a new body by consuming their own flesh! We remain in our human form as we change. Similarly, the cicadas’ seamless transformation suggests that there are no…blazing transfigurations to be encountered in the Hindu moksha, the Buddhist nirvana, or the Christian union with God. Everything that happens to us in this material universe we reside in happens in the material body that we inhabit. What we may, at most, aspire to is a quiet and subtle acquiring of wings after years of working hard in the burrows of our life – which is something that may happen while we are still crawling with our tired bodies on the trunk of trees! This is the cicada’s fifth and down to earth lesson of transformation. the way the cicadas all together suddenly fall silent. Death as the sudden silencing of the cicadas – what a great simile! Almost every time I notice this mysterious sudden cessation, I also think of death. Death may come at any moment, in the midst of all activity, of all singing and merry-go-rounding. This sudden silencing of the cicadas, their call to memento mori, which happens a few times during the day, is their sixth lesson. Their seventh and final lesson is none other than the larger significance of this very essay: I always need to question what I think I know, my final conclusions about a subject, especially the many ideas I grew up with and hold dear. And never cease to inquire, and learn, and revise my knowledge, opinions, values; and I should always try to listen again to a song that seems monotonous; and seek to find the beauty hidden in what seems to be an ugly, uninteresting, and lazy creature, especially if it happens to be a human being. Whatever living creature crosses my path may withhold many mysteries and gifts and lessons. Never should I rule out a monumental encounter, such as getting to know better my seemingly boring passerby, the cicada. The world is full of them, if I remain open to surprise.